We're Awakening! 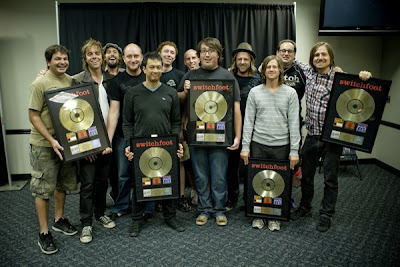 : Switchfoot - "The Early Years" Goes Gold! This is somewhat old news (it was certified gold a year or two ago), but the band just received their golden record plaque awards for their "Early Years" compilation at the Nashville show! 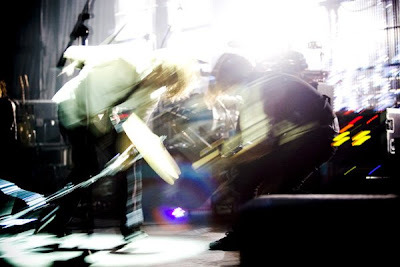 Congratulations, Switchfoot! Here's to many more gold records to add to your illustrious collection. Background: "The Early Years" was a three-cd set of the first re:think records from the band. The set included "The Legend of Chin," "New Way to Be Human," and "Learning to Breathe" all in one case, complete with original album art and lyrics booklets. It was released in 2004, after the enormous success of "The Beautiful Letdown," and was a welcome addition to new fans' Switchfoot collection. back at the venue, things were being prepared to film tonight's show for something. i don't think we really know what it's gonna be used for quite yet, but it should look awesome with this stage setup and whatnot. well, the camera peeps came on a good night, cause the guys pretty much owned. they threw dirty second hands in there for the first time all tour, and boy did it rule with all this new production and stuff. so good! Can't wait to see what this could possibly mean!